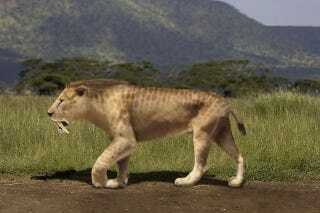 Were our earliest hominid ancestors hunted by saber-toothed tigers? Several million years ago, one of our oldest primate ancestors may have lived in fear of prowling saber-toothed tigers, according to new fossils that place the fearsome predator in the exact same part of Africa as these ancient primates. The hominid in question was Sahelanthropus tchadensis, which lived a few million years ago in what is now Chad. There's still a lot we don't know about the species, including whether it is actually a hominid - it may date to a period before hominids and chimpanzees diverged along separate evolutionary paths. "With our present data, we don't know what precisely the interactions were between a primate and a big carnivore. But probably these interactions were not so friendly. Sabretooths hunted all mammals; bovids, equids... and primates. The interactions were also more 'psychological', exercising a stress on potential prey. We can't prove it but it's probably important because in that case, primates had to live near closed environments like gallery forest." For more on this story, you can check out the BBC News website.